Club Penguin Cheats by Mimo777 Club Penguin Cheats by Mimo777: Check Out the Night Club Upgrade! "Discotheque"?! example: if everybody is dancing and is blue, the lights will turn blue or black or orange red etc. If enough penguins are in the night club of the same color the colors change! It can take at least 10 penguins and if there are more the effects are better. Please credit me if you use this tip! Thanks. Mimo didnt i tell you about the dance party? Yeah, but how do I gather so many penguins? people(or penguins) are very arrogant these days! Hey mimpo this is wiggelsboosh and i have worked out something! um... i think u need at least 1 member in the room for the discotheque to happen. but its still pretty good!!!!!!!!! Hey mimo discotheque is the most awesome song ever!!!!!! It's by U2 google it people. By the way the nightclub is awesome!!! Still, the most important to know is... the reason the Night Club has been transformed into a Discotheque. Maybe just an update for the Night Club, making it even more cooler, or has something to do with the mission, Yeti, and probably Herbert? This question has a lot of question marks for me. it turns black and white when a wholelot of penguins are in there! Awesome! Mimo, it sometimes turns RED! Check it out! Mimo! This is AWESOME! I understand it! If the most of penguins are BLACK, it turns BLACK! And most of penguins are RED, it turns RED etc. Mimo! I have a prediction! Maybe Herbert P. Bear heard that we love parties and are easily distracted by them, and he created this so that he can steal the puffles! Hey Mimo I'm a 3 star member and all the CRAZY things that went on in the night club were awesome the stars glow lights spin and the back round!! Also every thing is black and white!! Kinda weird huh? Discotheque comes from a greek word discothiki! Im from cyprus! Everyone says what Atril says but It never works for me! All it does is turn red! Sorry I couldn't Mod yesterday! B-day celebration going on! The more people that are the same color and are dancing changes the color! ;), It is AWESOME! Am I annoying you? I'm so sorry if I am but I really need more votes for this! If I can get a few more I can start calculating the results! actually,once its after than 8 penguins(members or not)things start to come out,like the disco ball...u know...and about the speakers pin...first,pins dont get bigger,they are designed not to pass a limit exceed!second,its actuualy smalla nad cute(but I really dont like the new concept,speakers)...i mean how small dop u want it to get? ?Like a micro thing??? people are saying that candace will come! idk for sure if they are rite but wat do u think? man the dance club is awsome! Yeah, thats true! If you get more than 20 penguins it changes! Awesome, huh?! Cool! Thanks for your tip! Mimo might post about it soon! But not only you, lots of people told Mimo about it! Wow Mimo! It looks like a new puffle. A zeebra meteor puffle. Hmmm... I dont think its about new mission. I think its ALL about FUN! Also, I think this party (or should I say mini-party) will stay FOREVER! Just an idea. What do you think? Just for this week or Forever? Lol! And CP (actually Billybob) wanted to make us go and party at the night club! Cool! But I dont think its about membership. Night Club turned into Black and White because there were more than 20 penguins and most of them were black.. This proves BLACK is the most popular color on CP, huh? Dont believe them! Just a rumor. The forest was changing color. I actually dont know but I think Cadence wont visit CP this time.. (But not sure)..
Congrats! I'm 1097 days old today. This is great! (Should I say happy b-day?) lol. Right! You need to get people to see the chance!.. And because of this it doesnt work on empty servers.. I really wondered which number will win! When will you comment the results? Yeah, I loved this 'Discotheque! lol! And check new igloo musics, pretty cool! As I result, I really enjoyed this party (mini-party) lol. I was waiting for new mission, but... Anyway maybe next time..
And, Im going to email CP about new mission, and I will share their answer by commenting ASAP. Keep commeting and modding everyone! coool!!! now it actually looks kind of like a real night club! the color changing efects are cool too but i wonder if all the penguins are different colors, do you think the lights would be RAINBOW?! HI MIMO I WAZ IN UR PIC AWESOME I WAS THE PENGUIN C A V1997!!!! i can tell u right now that it probably doesnt have anything to do with the mission. but on the other side of the coin, the last scene with herbert was when he dropped the seed packet and escaped. so maybe it DOES have something to do with the mission but actually i dont think so. Don't Wory You It Will Work For You Soon.Oh I Almost Forgot The Pin isnt in the Nightclub its in the Pet Shop. This has nothing to do with the mission im pretty sure unless Herbert wants to ruin our fun by upgrading the nightclub??? Its not there! todays friday but its not there! Well its more of a constation. You know in the BOX DIMENTION when you throw a snow ball, the snow ball makes waves until it land where you wanted it to land! i have zebras smell funny on my i pod now i burst out laughing!!! and i use music to get to sleep il be dreaming about zebras when that song goes on!!! this new feature is permenent!!!! Ok! Thanks to you, #5 is in the lead! Ok, I am gonna post the same comment I have made a bunch of times with the options on the next post Mimo makes, and then I once I read all the comments with their vote on that post, I will calculate the results! I luved my present! (Only got 1, it was expensive my mom said!) It is a cute outfit I got today from this store that no one likes called Justice. But, I have already said my age, but my mom said I wasn't allowed to say it...it is a number between 10 and 14. Oh, and only put (CPG Mod) when you are Modding! Seriously? That would be so cool! I know! "Zebra's smell funny when there nose is full of food" Lol that is so funny! Oh.So sorry about that.Maybe you should wright to cp and tell them they may not know.Anyway the mine will reopen don't worry. Well Caseys Man you may have but maybe Mimo found it before you. I too have waited for CP to update so that I could tell Mimo about it but Mimo is to dang fast! I really doubt that club penguin will end any time soon. Whoever said that was just trying to play a trick on people and be mean. Yes! You are right! Now that's the SECOND French word I know!! Oh Really!!!! I didn't notice that!!! I'll have to try it now!! Good Eyes!!! Lucky! I need to meet the Penguin Band, Sensei, and Aunt Arctic. Good luck with finding Aunt Arctic. I am glad CP put up something new. At my town there was a huge snow snow storm. it started on thursday. On thursday we got out of school at 12:10. and no school on friday. There's a new book in the I have a Book section! The Puffle Switch? WHAT?! THEY DID?! OMG!!! Ok listen, dont listen to those people(penguins) they arent telling the truth. Besides, CP wont end soon. Its too good of a game! Umm, you can only vote for one, so tell me which one you like better, then I can write that one as a vote! Hehe, GO BUNNY GOOOOOOOOOOO LOLZ nice computer drawing of the bunny. I can oly do a bunny. LOLZ hope 2 c u at the PARTAY! WOOT! HYPER AT THE MOMENT WOOT!!!!!!!!!! I like this upgrade! Maybe they'll keep this forever. 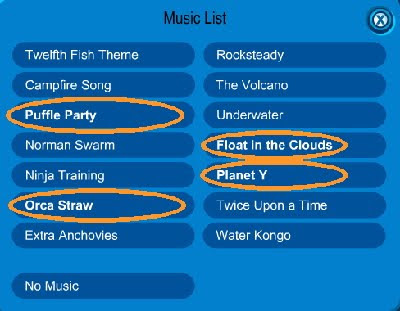 Also, have y'all noticed how one of the new songs is a PUFFLE song? Is CP planning to bring back the Puffle Party and maybe introduce a new puffle? This is what I think. Huh. i never noticed that. nice job paying attention! really? i'm gonna try that! LOL!!! And thanks Mimo!!! Youre the best!!! that is what i think too. i really like the puffle party. hey mimo mabye all the puffle stuff means where haveing a puffle party like last year again! Hopefully more will be revealed soon, so be sure to keep checking the What's New blog for updates. If you have any other questions please feel free to let us know. Our team is always here to help in anyway we can. Thats what I think! I KNOW ITS GOING TO HAPPEN!! Oh yah! Happy B- day!! Hey! did you know that if you throw a snowball in the box dimension it will bounce until it lands at the spot where you aimed! Yes it also changes the colour depending on the amount of penguins the same colour there and just to let you know (CPG MOD) goes in the user not the comment. Cool! First "Migrateur" then "discotheque'. The Puffle Switch? Hmmm inteeeresting. Yeah, that just makes the quality worse. The night club is so cool!!! Oh and it turns whatever color the most penguins are. That has been there since the Easter Party. An egg was hidden and you could turn off and on the light to see the egg. It was like one of the first things I noticed. Hmmm way to give a hint CP! I am glad CP put up something new In my town there was a huge snow snow storm. it started on thursday. On thursday we got out of school at 12:10. and no school on friday. hi i think i found a cheat for the costume trunk... on the first page click on the radio and a silver wand will come up... if you already knew about this cheat sorry!!! Oh and how do you get those kool emote thingies...? Yeah, he posted it! No need to say sorry, we always need people like you just in case he misses something! Thanks for voting! So far #5, your vote, is in the lead with 4 votes! the most other votes is 2 for...well #2! The others have only 1 vote, all except for #4 which has no votes! Lol! The Night Club 'Facelift' isn't gone. You were probably in a server where not many people were in the Night Club. You think? Yeah, that's gotta be it! Maybe a new puffle...? Sounds like you live in a place where the moisture and low pressure system met. That is how most big storms start. Lol me too. It didn't snow a lot, but the roads were bad so I got out at 12:15 on Thursday and no school on Friday. I think the Night Club is okay, but only if you have a lot of people in it. Yeah, thats true! But it has been here since Easter Egg Hunt '09! Excellent! Thanks for your help! Mimo may post about this! Yeah, great observation! Thanks for your info but Mimo has already posted about it! -Sneak Peek - Attention Secret Agents! -You Decide (& Sneak Peek)! You can find these posts from CP Whats New Archives! Hey Mimo, something to add to puffle pattern, On the unlock a book I saw a book called the Great Puffle Switch.What could that mean? This is completely random, but I love the way you end your comments. "peace, love, and polka- dots" is so cool! Hey Mimo did you notice that there are 7 new flags in the clothing catalog and they changed the flags backround? What's up with the agent behind the lighthouse on the login page? i noticed the new background but not that they added 7 new flags! i rarely check back there because they always have the flags pin. OMG! this could be a clue linking to the new mission maybe! the title is "The Great Puffle Switch," right? so then maybe Herbert stole the golden puffle and replaced it with a fake! then when WE realize it's a fake, Herbert probably used it for a contraption or sold it to ean a quick buck. That's my theroy. Feathergreen here! Did you know that if a lot of penguins dance in the same color in the Night Club, the lights change that color! What do you think about the musics? Well, for me BORING! I gave up my rare music "Zero Gravity" for this! But you know, I am setting up a cruise at my igloo and you're invited! You can get the VIP room, which NOBODY got yet. So what do you say Mimo? Well if she was. Mimo would've made a post on it or put up the Candace tracker. after a while of study about this ur word Discotheque is night club in french. Yes TulipPearl1 is right mimo would have put up a post about it and i don't think she will come. Yep mimo mentioned that, pretty cool huh! Nope Candence isn't coming, this seems more like an update than a party.